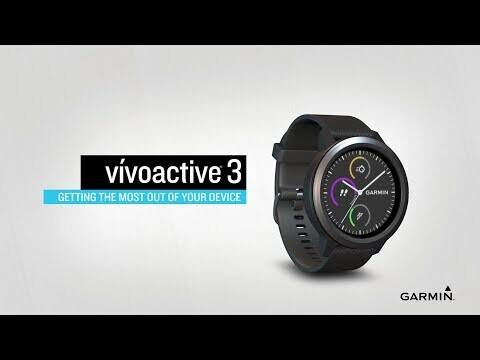 Classic watch looks, modern watch features: the vívoactive 3 fits tons of tech into stylish, ultra-light package. Thanks to Garmin’s Elevate optical heart-rate monitor, pulse information comes straight off your wrist. GPS provides speed and distance information while outdoors. Outside or in, an accelerometer turns your movement into data, giving you credit for workouts in the gym and on the trails. Pairing it with the free Garmin Connect app on your smartphone opens up a whole new set of features: review activities, receive notifications, control phone apps like music players or VIRB cameras. Follow daily highs and lows by tracking stressors (monitoring your heart-rate variability). When stress levels are high, a relaxation timer will walk you through steps to reduce it. Monitoring your activity and heart rate 24/7, Garmin’s tech learns your activity level and guides you towards a healthier lifestyle. Built-in activity modes for biking, running, walking, swimming (indoor only), strength training (with rep counter), and more. Pre-loaded and customizable workouts help you hone your training. Move IQ intelligently detects and tracks your activity; these activities appear in your Garmin Connect timeline and ensure you get credit for all of your daily exercise. Garmin Pay™ contact-less payment system (coming soon), will let you pay for purchases through convenience of NFC. 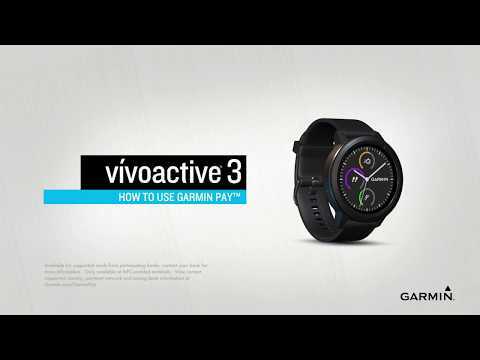 By linking credit cards to your Garmin account though Garmin Connect, you can make payments with your watch. Internet Live Tracking during activities (through a connected smartphone) allows you to share your location and heart rate with friends, family or coaches. Equipped with Garmin’s new lower-profile Elevate™ optical heart-rate monitor, which provides more reliable constant heart-rate data and allows you to train without a chest strap. Optical heart-rate sensors measure changes in blood volume under the skin and work best when worn snugly, 1 to 3 finger-widths above your wrist bone. Broadcasts your HR over ANT+ (so other devices can pick it up). Stress level score monitors heart-rate variability while inactive to produce a stress score from 0-100; the lower the score, the lower your stress. When stress levels are high, the vívoactive’s relaxation timer takes you through steps to lower them. Through 24/7 activity tracking, vívoactive learns your activity level and helps guide you towards a more active lifestyle. On-board sleep-tracking mode monitors your rest, letting you see your total sleep hours as well as periods of movement and restful sleep in your Garmin Connect profile. Counts flights of stairs with internal barometer data that’s combined with your step data. Weekly intensity minutes are displayed against the ideal of 150 needed to maintain a healthy life. Automatically syncs your data to a paired smartphone running the free Garmin Connect app. Connects with ANT+ and Bluetooth Smart sensors, from foot pods, to speed and cadence pods (but not power meters). Connect IQ support allows you to download apps, templates, data fields, watch faces and other features. Internal GPS and compass offer basic waypoint navigation. Intuitive touchscreen and Side Swipe™ interface make navigation easy. Always-on, colour display is bright and clear in any conditions. Ambidextrous design lets you choose which way is up, making sure everything is in the right place regardless of which wrist you wear it on. Internal memory stores up to 7 timed activities and 2 weeks worth of daily activity. Garmin Connect will store all of your activity data. User-friendly strap changes, thanks to quick-release pins. Tough Corning® Gorilla® Glass 3 crystal. Rechargeable lithium-ion battery lasts up to 13 hours in GPS mode or 7 days as an activity-tracking smartwatch. In the box: vívoactive 3, charging/data clip, documentation.